So, you’ve submitted a bunch of job applications and you haven’t heard anything. You may feel helpless, but there is something you can do! First: Gather feedback that can help you to better attract attention. Ask your Co-op + Career Advisor to review your application materials including resume, cover letter, and any correspondence. If you are submitting a portfolio, get that reviewed too. Second: Follow up to inquire about the status of the position. Context: Pushy or Helpful? Desperate or Communicative? Many people are initially uncomfortable with the idea of follow-up. They don’t want to appear pushy or desperate. Good news is: You can follow up without making a bad impression! Your recruiter or hiring manager likely has a pile of applications that they need to sort through, but other competing priorities keep them from digging in. By contacting them and expressing your ongoing interest in the job, you make it easier for them to engage with you and get started on the vetting process! Be extra helpful: Include your resume and cover letter in your follow-up so there is no need to search for your application. I often advise students to have something new to say when they follow up. Find a recruiter or a relevant manager by searching on the company website or LinkedIn. There is usually a main number or general email available on the company website. In start-ups and small companies, sometimes these emails and calls are answered by the founder or owner! Have a name, but no contact information? 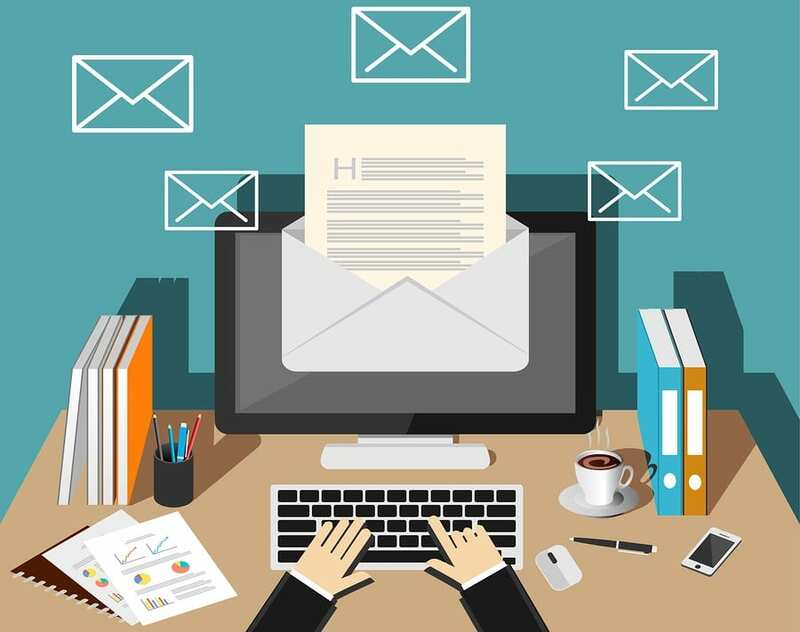 Websites like hunter.io can provide you with guidance regarding the email naming conventions for most companies. Whether you are preparing for a co-op search or a job search, the Center for Cooperative Education and Career Development has the resources you need to be successful. If you haven’t met with a Co-op + Career Advisor yet, give us a call at 617-989-4101 to schedule an appointment and we’ll get you started on the right track. In a previous post, we discussed the basics of graduate school, focusing mostly on Master’s degrees. If you have not seen that post, you can find it here. In this post, we will instead focus on PhD programs, with some touches of other degrees. What is the structure of a PhD program? What are the basics? A PhD is definitely a large undertaking than a master’s and needs to be considered carefully. A PhD can take 4-7 years full-time beyond the Master’s, possibly more depending on the topic and the advisor, or if you choose part-time. Because of the difficulty and the time commitment, you need a good reason to go into a PhD program. The main reasons to pursue a PhD are because you want to go into academia, say as a college professor, or if you want to get into really cutting-edge research either at a university or at a large research lab. Both of these positions typically require a PhD. If the reasons you are thinking of a PhD are more like, “I want to be called Dr.” or “I don’t have a job, so I am thinking of grad school,” or “My family wants me to,” those are reasons that often result in burn-out. 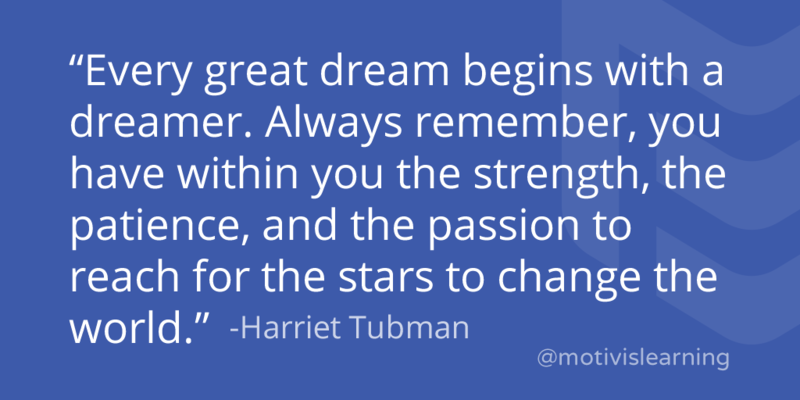 PhD is a long, difficult road, so it is important to have that pure motivation to help you through the harder days. Having that light at the end of the tunnel is key. You will build a network of fellow graduate students, typically your lab, that will become friends and “academic family” for life. The head of this family will be your advisor – the relationship you have with this individual, unlike an “academic advisor” in undergrad, will greatly determine your level of personal happiness, time to completing the degree, and job prospects upon graduation. What role does a PhD advisor have? Your advisor will help determine your specialty, your projects, and your day to day activities. You will choose your advisor, and he or she will also choose you, often helping to pay you something through stipend. When you apply to PhD programs, you want to research potential advisors. Everyone has different experiences with their advisors, but the key is to have a strong working relationship. You will spend a lot of time with them and they will determine your project and your classes, so you need to be able to work with them. The advisor is also the source of funding. If accepted to a PhD program, you will want to be fully funded. This means tuition and fees fully paid for, as well as insurance and a small living stipend. By small, we mean enough to share an apartment, feed yourself, and very little else. Would I be taking classes within the PhD? You will take some classes, but mainly in support of your PhD research, which is chosen by you and your advisor. You may audit, or just sit in some classes, or actually take them for full credit. But, after any mandatory coursework, expect that you will spend 60-80 hours a week doing research in a lab of some sort. Most of your research time, you are learning how to do literature searches, conceptual and practical research, how to think critically and deeply about data, question assumptions, and basically learn how to be an independent researcher. You will also do presentations, write papers for journals and conferences, disseminate your research to the community. All of these will hopefully lead to your dissertation and defense. What is the dissertation like? The main component of PhD activities revolves around doing original research and publishing it. The dissertation is a basically a medium sized text-book on your field and your specific topic. I have seen theses at 200 pages or some over 400. You will then defend your thesis in public, but mainly to a committee of faculty of 3-6 people. Your advisor should help to prepare you the whole time, so when you get into the defense, you are prepared. In that defense, you are proving that you are the foremost expert on that topic, regardless of how esoteric the topic might be. In the end, getting a PhD means having a passion for a particular topic, a reason to gut through the hardships and time, and the grit to continue. My PhD was trying, but I don’t regret it as it has led me to where I am now. You need to love the research or aim at a job that needs the PhD, otherwise it is tough to make it through. Other than Master’s or PhD, what other degree options after a Bachelor’s are there? Other degrees are out there: MBA, law, medical. I can’t necessarily speak to all of these here, but other podcasts/seminars will discuss how to go into these different fields. There are also plenty of resources on campus, including the co-op and career center and instructors/professors. It is easier to transition than you might think to pursue graduate education in a field different than your undergrad. Essentially, you might need to take some bridge courses to give you a new foundation, but that should only add 1-2 semesters, and depending on your background, should be fairly straightforward. For more questions regarding the application process, please check back later in the semester for Part Three! Make an appointment with your Co-op + Career Advisor by calling the front desk at 617 989 4101. How does a co-op or job search differ for First-Generation students? Before I can get into those nuances, we must first define what it means to be a “First-Generation” or “First-Gen Student”. This definition varies slightly from institute to institute, but here at Wentworth we define First-Gen Students as “students who come from families where their parents did not complete a four-year college degree.” What this ultimately means for students who are the first in their families to attend college is that there is a “possibility that a student may lack the critical cultural capital necessary for college success because their parents did not attend college (Defining First Generation, 2017).” This does not mean that a First-Gen student will not be successful, it just means that they face hurdles and obstacles to navigating the college experience that their peers with parents who can guide them through the process, do not. When it comes to a co-op or job search, First-Gen students often face additional challenges to understanding and conducting their search as well as with the transition from college to work. From my own personal experience as a First-Gen student, I can remember not knowing where to start. Some of my questions included: What are my career path options? How do I network? What do I need to include on my resume? And why do I need to write a cover letter? The good news is, you don’t have to know the answers to these questions, you just need to know who to ask to get the support you need to be successful in your co-op and job searches. This is where your Co-op + Careers Advisor comes in! The first day I walked into the Career Center at my University I was determined to get a summer internship between my Junior and Senior years but had no clue what career paths were available to my major, and the types of internships that would help to position myself for a future on that path. I was also very intimidated by networking because I knew my parents and extended family did not necessarily have connections in the field I was headed into and did not know where to begin building my own network. Through a series of follow up meetings, my career advisor helped me identify several paths that I could take (which included making my way to the job I am in now), supported my search through helping me tailor my resume/cover letter for each opportunity I was interested in, and educated me on the various on campus and off campus opportunities to network with and meet employers. The moral of this story? The first thing you should do is seek support and ask your questions! At Wentworth, you have a dedicated Co-op + Career Advisor based on your major who is here to help you prepare for conducting your co-op and job searches. They can help you navigate choosing opportunities that are a good fit for you, strategize ways to make connections through on and off campus opportunities, and cheer you on through your whole process. Your professors are excellent people to discuss your career goals with and identify industry events that can help you on your search. So, what do you do if you or members of your family don’t have connections in your target industry or at employers you are interested in? First, don’t worry – your networking is a “living” resource, that grows with your career and can change as you gain experience and expertise. It is normal not to have a network if you don’t have work experience and haven’t been participating in industry events. Don’t let the lack of an established network prevent you from taking steps to build yours. You can start creating your network right here at Wentworth through events and opportunities to connect with employers and your peers, including: the Fall and Spring CO-OP + CAREER Fairs, Mock Interview Day, Wentworth on the Road, Employer In Residence drop-ins, Employer info-sessions, and major specific events. Want to take your efforts a step further? This article outlines 6 ways to get ahead when you don’t have connections. To meet with a Co-op + Career advisor, make an appointment or swing by fall drop-in hours every Monday, Wednesday, and Thursday from 1:30 – 4:00 PM. Our office is located at 101 Wentworth Hall. Feel free to contact us via email at coopsandcareers@wit.edu, or call us at 617-989-4101. Our annual Mock Interview Day was held on Thursday, November 1st from 3:00pm –6:00pm in Watson Auditorium. The day consisted of five rounds of 35-minute interviews conducted by 41 employer volunteers from multiple companies across industries. In total, 108 students participated in 192 interviews, providing on average two practice interviews per student. Many of the employers will be inviting students back for formal interviews. Sending a thank you email to the employers with whom you spoke. Find our guide to thank you notes here. If a recruiter gave you specific instructions, be sure to follow through on those items and then follow up with the recruiter. Unable to send a thank-you note for lack of contact information? Stay connected with social media: find the company or even the person you spoke with on LinkedIn or Twitter. Follow their feeds to stay up to date with new openings and other news! 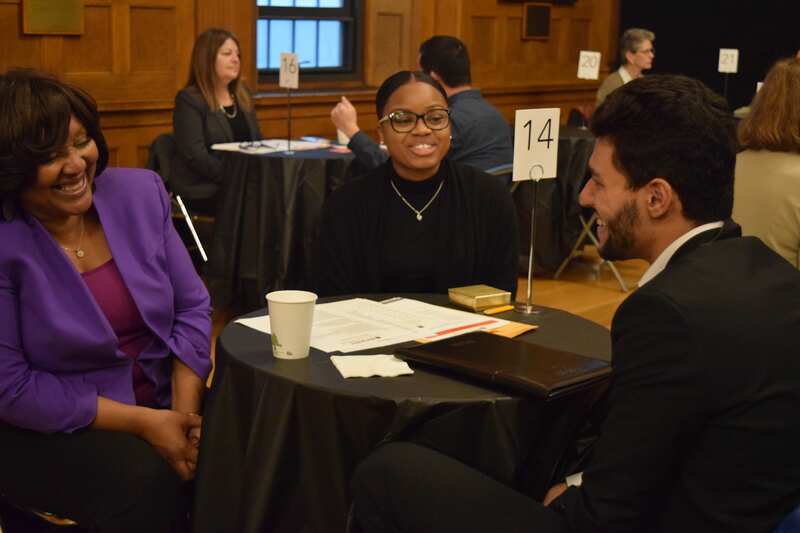 If you were unable to attend Mock Interview Day, be on the lookout for future opportunities to engage with employers and don’t miss the spring CO-OP + CAREER Fair on March 19th, 2019. Check WITworks as we get closer to the Spring Fair for updates on employers attending. Employers, invitations for the spring CO-OP + CAREER Fair on March 19th will be sent out in the new year. 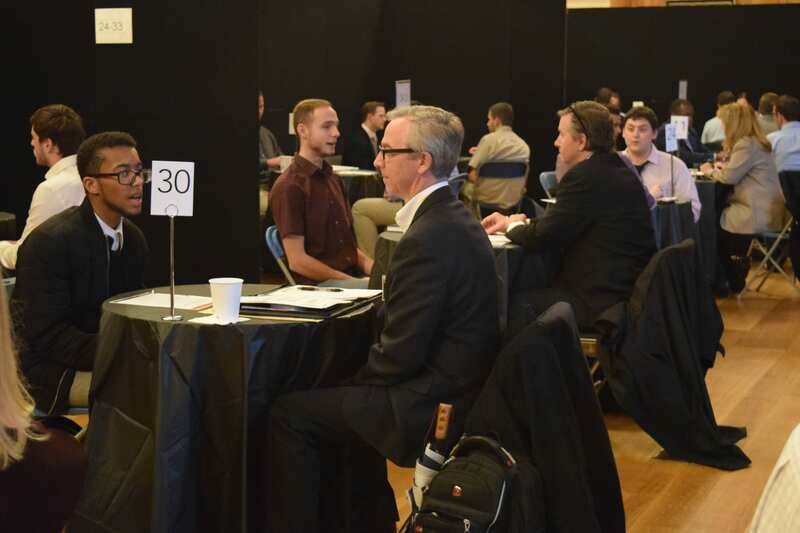 Thank you to all students and employers who joined us on November 1st to conduct practice interviews. We look forward to seeing everyone in the spring!